Facebook keeps reminding me that seven years ago we were involved in a big construction project. And, when I say we, I really mean the Boss. 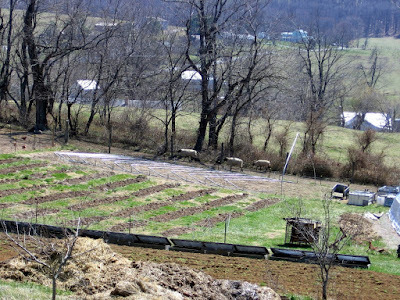 The construction project became an integral part of the farm and without it, vegetable production during the near-constant rain of late would be next to impossible. Or at the very least, incredibly soggy. Seven years ago, we were smack-dab in the middle of putting up hoophouse #2. We had talked about putting up a second structure for a couple of years, but always got stuck when it came to the cost. Around here, our budget is perhaps the single most limiting factor (nope, take that back…now, it’s our aging bodies). But, funds have always been tight and borrowing for a hoophouse out of the question. While it would be nice to expand our greens production, we were content to make do with things as they were. We had a row of wooden cold frames set up along one garden spot and while they had a host of “issues” (wind being the biggest problem) they were fairly productive. Some time earlier, a young couple had joined the Market. 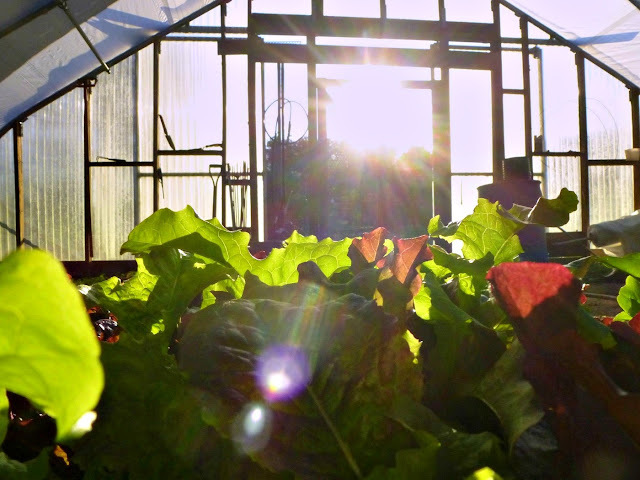 They bought a farm out in Highland County and built a greenhouse to aid in vegetable production. They set up a road-side stand and had plans to become big-time Market gardeners. All went well for several years. But, like the Kenny Chesney song says… Life has its way of movin’ you on, don’t it? The young couple (who was by now a family with a small child) decided to leave the wilds of Highland County, give up vegetable production and move back to “civilization”. Did anybody want a greenhouse? They were willing to sell it…CHEAP! The Boss’ ears pricked up right away. We would be able to afford a used greenhouse. If we really scrounged, we could find the funds. They wanted $800 for the greenhouse, the gas-fired heater and a number of ventilation fans. This would have normally run about $3,000. Such a deal! The biggest challenge then would be to find another “flat” spot for construction. Yes, “flat” is a completely relative term here on the hill. Our house, barn and hoophouse #1 take up the only really flat and level spots. The rest of the property rolls and undulates and the front portion drops off steeply to the creek, making it suitable for grazing and nothing else. But, a reasonably flat spot was located. So, with cash in hand, the Boss and Toughchick headed out to pick up the new greenhouse. He was excited to get this hoophouse. She was excited to visit the wilds Highland County. When they finally got back, I was somewhat dismayed. I knew we weren’t getting an actual hoophouse (try moving that down the road…particularly over the mountains to Highland County) but I was not prepared for what appeared to be a pile of junk. An enormous pile of pipes and well, junk. that, my friends, is a hoophouse! The pile of junk…I mean the new greenhouse…just sat for a while. For what seemed like a LONG while. A VERY LONG while. As in, I thought it would NEVER get put together. The rhythm of the Market prep and the demands of the growing season leave little time for construction projects. And, contrary to popular belief, you don’t just throw a hoophouse up overnight. Finally, the new structure began to take shape. No longer a pile of junk. We had a new hoophouse! We started utilizing the space long before the project was completed. That first season we didn’t even have end walls until fall. I honestly don’t know how we avoided critter damage that summer. 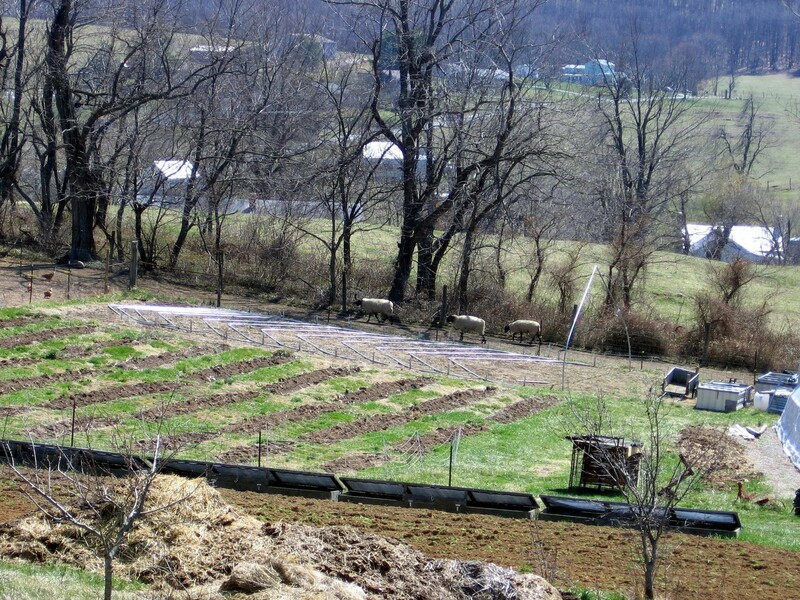 The groundhogs didn’t discover the paradise of lush greens until the following season. Hoophouse #2 has been the sight of some epic battles with the blasted “whistlepig” (did you read THIS?) I hesitate to say that we have finally outsmarted the varmints…but, so far, so good. Over the years that space has produced amazing amounts of radishes, green garlic, celery, scallions, spinach, arugula, dill, basil, fennel, beets, carrots, Chinese cabbage, kale, mustard and loads of lettuce. In recent times, we have cut down on the wide variety, choosing instead to produce larger quantity of various items. We have even been able to extend the season so that we have some sort of growth year-round. YES, that is snow piled up behind me! All that to say, this is an incredibly productive 26 x 48 foot space. I must say, that $800 investment has been repaid many times over the past seven years. …and today as I begin greens harvest for the week (and it’s raining AGAIN) I am so THANKFUL for the deal we got on hoophouse #2! How prolific and how fertile your land all looks. The produce of all your hard work ovr the years I am sure. I loved reading this post. You both put so much hard work and love into your farm. May this hoophouse continue to bring you may fruits for your labour. I'm sure it wouldn't have looked like a hoophouse if I had been in charge. lol My husband can build almost anything, so he's the man for the job. The big salad spinner is the size of a 5-gallon bucket. Again, a job for the hubs, I don't have the upper body strength to get it going fast enough to do a good drying job. I just found out we can motorize it. Now that would be something!